I received my package today, I had ordered St. Tropez self tan bronzing mousse and the OPI Nicki Minaj mini set. This is the first time I purchased a mini set from OPI. Generally Ι liked the idea of mini set, this way you can try 4 colors from a collection, but the bottles are tiny, I wish they were at least 5ml each. 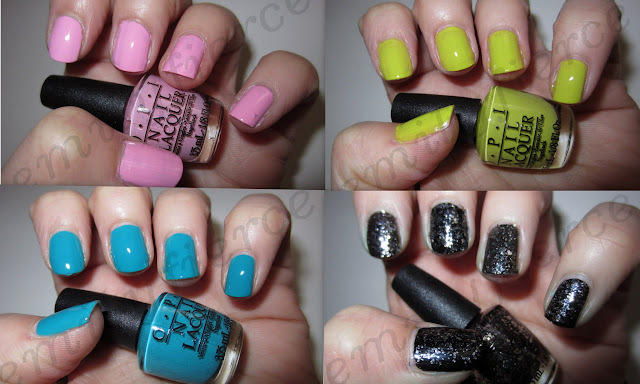 The set consists of 3 cremes and a glitter nail polish. Νormally, the collection consists of 6 colors, the ones I am missing are Save me a holo-glitter and Super Bass Shatter a deep purple crackle top coat. 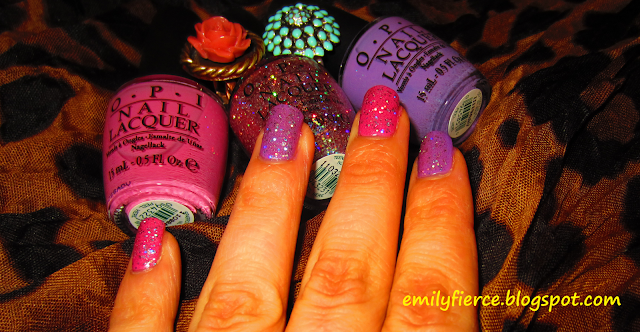 OPI Pink Friday. This is a bubblegum-barbie pink creme. Beautiful for all seasons. OPI Did It On 'Em. A bright yellow toned green creme. This reminds me of China Glaze Electric Pinneapple from summer 2011 collection but unfortunately I don't have it with me to compare it, i left it at my parents house. OPI Fly. A bright teal-blue creme. This is my favorite out of the 4. OPI Metallic For Life. My second favorite from the set. Silver hexagon and silver micro glitter in black base. On my thumb, middle and pinky finger I applied 1 coat of Color Club Where Is The Soiree as a base and two coats of Metallic For Life. On my index and ring finger I applied 3 coats of Metallic for Life. Comparison of the mini size with the normal size. Comparison of Pink Friday with Essie French Affair. Essie French Affair is lighter and cooler toned than OPI Pink Friday. I am so excited and happy, I have been nominated 5 times for the versatile blogger award by five beautiful bloggers, Lipsticked Louise, Obsessed About Beauty, MakeupByAnna888, Beauty and the Mist and "Beauty case" . Once again, thank you ladies for this award, it means so much to me. 5. 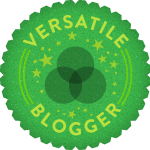 Add the Versatile Blogger Award picture to your blogpost. 1. I love bright colors and especially fuchsia. 2. My lucky number is 13. 3. I love spicy hot food. 4. I speak Greek, Turkish and English and want to learn Spanish. 5. I love pistachio ice cream. 6. One of my favorite songs is 'Bailamos' by Enrique Iglesias. 7. I love baking cakes and trying new recipes . Hair: This month my favorite hair product was Kerastase Elixir Ultime hair oil. I use this oil alot lately because I dyed my hair ombre and this is so good for the ends of my hair that became dry from the dyes. Face: My favorite face products this month was Revlon Colorstay makeup, Chanel Bronze Universal and Sigma flat top synthetic kabuki brush F80 (mine is the old version ss197). What can I say about all these? They are perfection. Chanel bronze universal is so natural looking and easy to apply. Revlon Colorstay is my HG foundation and along with my HG Sigma F82 brush they give flawless coverage. If you are interested you can see the Sigma F80 flat top kabuki brush here. Cheeks: My mostly used blushes for this month are Mac Mocha (matte) and Moonriver mineralize blush. I usually use Moonriver as a highliter because it is too light as a blush for my NW25 skintone and is very shimmery. On the other hand Mocha is a very natural looking matte blush that matches most skintones. Eyes: My favorite eye products were Urban Decay Naked palette, Mac Feline khol pencil, Mac 224 blending brush and Covergirl lashblast mascara. 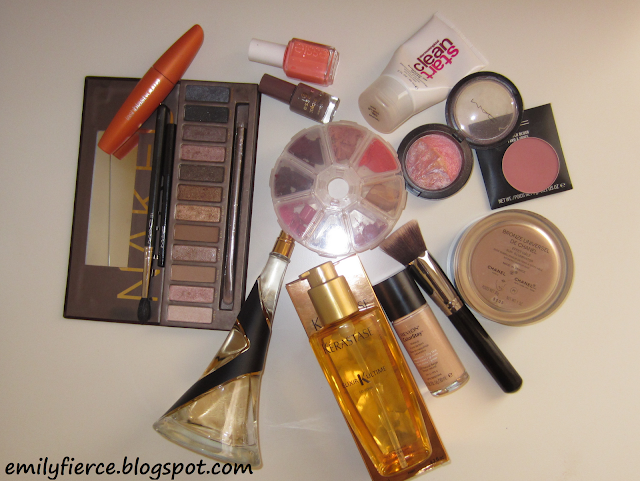 Naked palette is very useful for everyday makeup, it has very beautiful colors. I mostly use Virgin, Naked, Buck, Half Baked and Darkhorse. Lips: My most frequently used lipsticks in March were Mac Fleshpot and Snob lipsticks. I depotted some of my Mac lipsticks in the plastic container you see above for convenience. 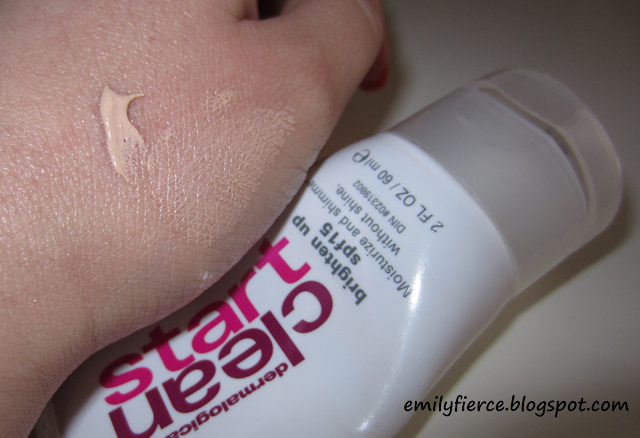 Skincare: My favorite skincare product for March is Clean Start Brighten up tinted moisturiser. I use it everyday and it gives me light coverage and spf protection. Perfume: Lastly my favorite perfume of last month, Rihanna's Reb'l Fleur. It is a sweet floral that I enjoyed wearing in March. That's all from me for now, thanks for reading, and see you again soon.